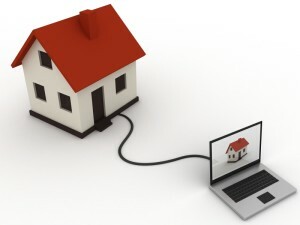 With all of our smart electronic devices, it just makes sense that our homes are getting “smart” now too. Over the next ten years this growing trend will become almost the norm, as The National Association of the Remodeling Industry (NARI) predicts 41 percent of interior remodeling projects will include some sort of “smart” installations, whether it is under counter plug strips and walls sockets with built-in USB ports for charging electronic devices, or “smart” systems for heating and cooling, lighting, and home security. And smart technology for automating the energy use in our home is more than just convenient—it reduces greenhouse gases and lowers your electric bill. Mobile apps let you wirelessly control the temperature and lighting in your home. These apps also allow you to view and adjust your energy use per room and even per appliance. Even more, new systems use adaptive thinking to calculate how long it takes a home to heat up or cool down and how to do it most efficiently. This kind of adaptive decision-making in these mobile apps can lower utility bills even further. Another great way to go green while lowering your electric bill and is by replacing old appliances with ones that are certified Energy Star. The air inside our homes can actually be more polluted than the outdoors, which can cause respiratory and allergy symptoms, as well as chronic diseases and cancer. While cooking is the major cause of indoor pollution, other culprits for bad indoor air can be found in the materials found in countertops, flooring, walls, ceilings, and even furniture. Lead and asbestos are the more commonly known toxic substances found in older homes, but even newer homes can make us sick for many reasons, including formaldehyde and other chemicals found in particle board and drywall, and the Volatile Organic Compounds (VOCs) present in paint and carpeting. There are things you can do to reduce the amount of chemical off-gassing in your home. Replace pressed wood or composite cabinetry with ones made of real solid wood. Give floors and surfaces a healthy makeover by installing products made of cleaner, natural materials. Whole home air filtration systems are also very effective to minimize the effects of dust, dander and allergens. These filters are installed into the duct work of your home’s heating and cooling system. The kitchen is potentially the most polluted room in a house, so if indoor air quality is a factor in your remodeling plans, a kitchen remodeling job would be the first place to start. These days more people are choosing to remodel rather than move. Some consider home remodeling with the future needs of their golden years in mind. Others remodel to accommodate the current needs of their live-in elderly parents. These types of home remodeling projects can be as dramatic as creating open floor plans and multi-purpose rooms or as simple as bathroom remodeling to install hand grips and shower seats. Whatever your home remodeling needs, Designers Northwest has over 30 years of experience in the Portland/Vancouver WA area, with the skills, resources and technical knowledge necessary to complete every remodeling project to exceed your expectations. Tell us about your home remodeling project today.